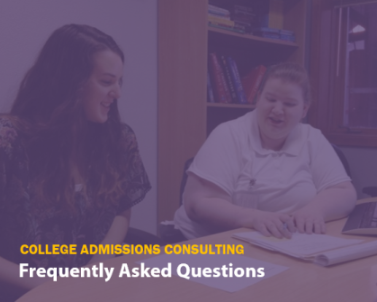 To help you in your decision-making process, we have compiled our top 10 FAQs on college admissions consulting. If you have additional questions, please contact us and we would be happy to speak with you. What kind of student should consider a college admissions consulting (CAC) plan? What will we do together in a comprehensive CAC plan? Okay, I understand the services. But exactly what will I get/do in a CAC plan, day by day? What is the difference between a CAC plan and what I do with my high school counselor? Can I succeed in the college admissions process on my own? How often will we meet and communicate outside sessions? How are parents involved in the CAC plans? Do parents come to sessions? What are your admissions outcomes? What kind of student should consider a college admissions consulting plan? A college admissions consulting plan works equally well for high achievers with exact targets, students recovering from achievement below their potential, and students who are undecided on colleges or majors. What will we do together in a comprehensive college admissions consulting plan? Campus Visits: Planning campus visits – when, where, registration, preparing questions for various constituencies, etc. Okay, I understand the services. But exactly what will I get/do, day by day? We offer three premium college admissions consulting plans. The Comprehensive plan is our most popular option. In addition, we offer two premium athletics advising plans. Get started with North to My Future, your free, individualized college admissions strategy session. If you have already completed North to My Future, sign up for 1 hour initial consultation with our college counselor for $150. If you purchase any of the premium plans above, we will roll the cost of the consultation into the plan. You believe you are on a solid academic/coursework/extracurricular trajectory and will need help mostly with finalizing your college list and applying to colleges. We recommend enrolling in a college admissions consulting plan no later than this time so you can take advantage of the summer before senior year to work on your application essays. Fall Semester of Senior Year You just learned about us! Your Frontier Tutoring college admissions counselor will work in cooperation with your high school guidance counselor. We serve as an enhacement to, not a replacement for, your guidance counselor. Guidance counselors are extremely important because they review your transcripts, help you choose appripriate courses for graduation, send colleges the official school report, as well as write recommendation letters. While guidance counselors are highly knowledgeable and excellent at delivering on their core functions, unfortunately in Alaska, each counselor is responsible for an average of 428 students. For this reason, most guidance counselors simply do not have the time to work one-on-one with students on specialized college admissions matters, nor do they always have the resources that are available to an independent college counselor. Yes, but it will require discipline, organization, and oftentimes extensive research. Even our most self-motivated and highest achieving students agree that having a trusted advisor to guide them through this complex process relieves added stress and saves valuable time. You will receive a custom college planning portal account and communicate with your college admissions counselor via face-to-face meetings, phone calls, emails, and our online messaging system. The frequency and duration of meetings and other communications depends on your needs and the number of hours included in the plan you choose. For an idea of how often students meet in a comprehensive plan, view this blog post. How are parents involved? Do parents come to the sessions? Typically we recommend that parents attend the first session to help provide background information. Students attend most other sessions by themselves, although parents are always welcome if the student would like them to attend. Parents often choose to join sessions related to topics such as financial aid and scholarships, or make final decisions among acceptances. Other than that, many students feel more comfortable talking about their goals independent of their parents. Throughout the process, parents are also welcome to email or call their student's college admissions counselor directly. Additionally, we are happy to provide parents with session summary reports if requested. Since 2014, 93% of our students have been admitted to their first choice colleges and 100% have been admitted to at least one of their top five colleges. Some of our students' acceptances include Dartmouth, West Point, the University of Chicago, the United States Air Force Academy, Washington University in St. Louis, and the University of Washington. View a full list of where our students are being accepted and what they are saying about their experiences with Frontier Tutoring.